Thirty years ago, as concerns grew in Sweden about pollution appearing downstream from pulp and paper mills, local firms developed chlorine-free pulp bleaching technologies. These technologies helped protect fish and ecosystems. They also opened up new markets in Germany for the Swedish firms’ more-environmentally-friendly products and attracted foreign customers for the clean technology itself. A win for Sweden’s environment and its economy. Clean innovation like this has been helping address environmental challenges and drive economic growth for some time. But one of the interesting things about the Swedish success story is the research that shows how environmental regulation helped make it happen. Yes, you heard me right. Regulation was partly responsible for this case of economic growth. Regulation often draws scorn from industries and firms. Consider the common refrain, “we’re being buried under red tape”. However, these industries and firms actually owe some of their success to regulation. How? Because it pushes them to find cost savings, to discover new processes and technologies, and to release new products. In other words, it pushes them to innovate. Environmental regulations run the gamut in Canada, from regulating vehicle fuels for air quality to regulating landfills for groundwater protection and everything in between. These regulations serve their primary purpose of protecting the environment. 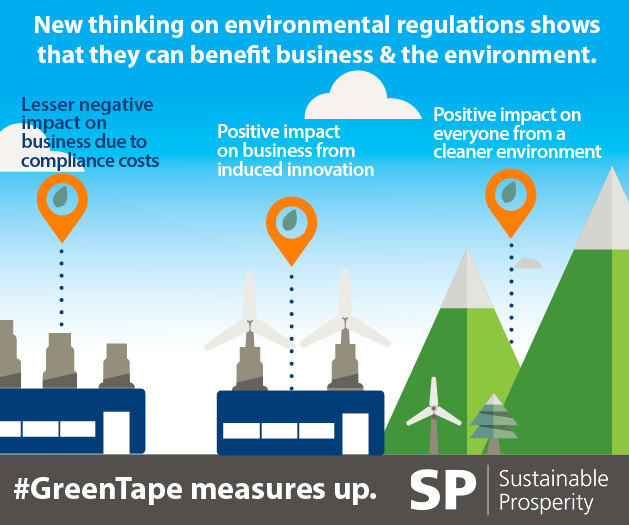 But do these regulations also achieve the economic benefit of driving clean innovation? This is a timely question for us to ask because while Canadian governments are rapidly making high-stakes climate policy, more than ever we need to harness the economic opportunity of combatting climate change. Regulation is an effective policy tool for combatting climate change. Earlier this year, Prof. Mark Jaccard from Simon Fraser University showed how environmental regulation – including the phase out of coal in Ontario – has been responsible for more greenhouse gas emission reductions in Canada than any other policy tool to date. So how can we ensure that we are designing regulation that captures the “double dividend” - that addresses climate change and also stimulates clean innovation and drives economic opportunity? Step one is timing. Regulation needs to be a way for governments to give local firms a head start on nascent domestic and international markets. If regulations are introduced after global competitors have already innovated and are established in the market, then Canadian firms are playing catch up, and the economic opportunity has diminished. Step two is to pay attention to the downsides. Regulation causes disruption for firms as well as potentially stimulating innovation. We need to measure and model both potential outcomes to ensure that we’re not hurting our domestic firms before they even get to the starting gate. Step three is design. Not all regulation is designed equal. “Regulatees” will tell you that they prefer performance- or target-based regulation over technology-prescriptive regulation because it gives them the most latitude to tailor make solutions that could eventually help differentiate them from their competitors. Early evidence supports this, showing that the more flexible and price-based market tools are more likely to induce a greater level of innovation. For instance, when the US introduced the 1990 Clean Air Act, innovation was hampered at first by a prescriptive approach which required plants to install scrubbers of a specific efficiency), but then reinvigorated with the introduction of a permit trading system which rewarded any innovations that achieved the same outcome. Finally, step four for designing regulation that stimulates innovation is consistency. Firms that are being asked to make investments in their processes and technologies want to know that the regulation behind it is credible and durable. If regulation is inconsistent over time, firms will naturally drag their feet. Unlocking clean innovation is the key to success for climate policy in Canada. If climate policy can stimulate and foster clean innovation, it will bring added economic benefits for Canadian firms. We are not alone in recognizing this opportunity. Industries and firms worldwide are developing and positioning their new and innovative products for this brave new marketplace. Canadian firms might well thank their governments for a little well-designed regulation to help push them to get a foothold.